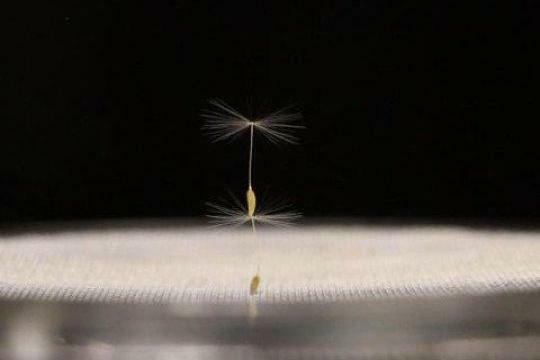 Oct. 17 (UPI) — Dandelion seeds fly like no other seeds. In fact, the flight mechanism used by dandelions is one-of-a-kind. The white, fluffy parachutes that help dandelion seeds find new soil to colonize are mostly air. But their novel design allow seeds to float through the air for more than half-a-mile. Advanced 3D imaging helped scientists better characterize the bristles that form each parachute. Using micro-fabricated disks, scientists experimented with different levels of porosity to replicate the effects of the parachute’s ball of bristles on air flow. Researchers determined a ring-shaped air bubble forms as air passes through the parachute bristles. The air bubble enhances drag, slowing the seeds descent and allowing more time to be carried away by the wind. The air bubble, which researchers dubbed a separated vortex ring, is stabilized by air flow. The parachute’s structure and the spacing of the bristles allows just the right amount of air flow to produce the novel class for flight. Because the parachute design is so efficient, researchers think lightweight drones could be modeled after dandelion seeds. Small, low-power drones could be used to monitor atmospheric emissions and pollution levels. Cummins and his colleagues published their analysis of dandelion seed parachutes this week in the journal Nature.